Medjool dates are succulently sweet with a caramel flavour, perfect for adding to these spiced muffins. Serve warm for a breakfast treat on Christmas morning. Preheat the oven to 200°C, gas mark 6. Line a 12-hole muffin tin with paper muffin cases. In a large bowl, mix together the flour, baking powder, bicarbonate of soda, sugar, cinnamon and orange zest. In a jug, mix together the milk, egg and melted butter, then pour over the dried ingredients. Using a large metal spoon, fold the ingredients together until just mixed, then gently fold in the dates. Divide the mixture between the muffin cases. For the topping, mix the sugar and cinnamon together and sprinkle over the muffins. Bake for 15-20 minutes until risen and just firm. Transfer to a wire rack to cool slightly. Serve the muffins warm. 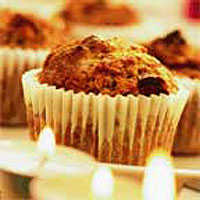 Leftover muffins can be stored in an airtight container and will keep for 3-4 days.